I have grappled with the acute shortage of source materials while writing biographies, particularly of people from the latter half of the 20th century, because telecommunications technology led to the demise of letter writing. And also because most Indian families do not preserve letters, let alone archive them. Letters are such a rich resource for historians and biographers not only because they provide evidence for events in the narrative of the life one is reconstructing but also because they, often, give you a glimpse of the social and political issues of those times. The book by Sheela Reddy is evidence, if ever one were needed, of how rich and credible the narrative can be, if such resources were available. The bundles contained not only letters about the Jinnah couple written by the members of the Naidu family to each other, but also several letters written by Ruttie to Sarojini Padmaja and Leilamani. She was very close to the Naidu family who, in later years, appear to be her only source of emotional support. Sarojini Naidu also knew and greatly admired Jinnah; so, in some of her letters to her daughters, she does have some observations on what could have been his thoughts and motivations for some of his personal as well as political decisions. 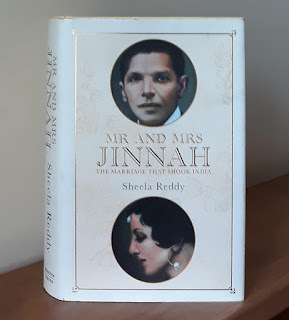 What the author has done remarkably well is interpreting the content of the letters bringing to life the solitary, misunderstood Jinnah and the lonely, wistful Ruttie, weaving deftly the social and political ethos and issues of the times without losing focus on the main narrative. It would have been so easy to stray into a description, or even analysis, of the tumultuous events, the ferment of ideologies and ideas, and the number of important and interesting people that criss-crossed the lives of this star-crossed couple. However, it is not just access to the resources that makes her book unputdownable; it is the author’s intensive and meticulous research, reflected in the nearly 50 pages of notes (of the 421-page book) that are as interesting and engaging as the story of the ‘marriage that shook India’. However, as a researcher and social historian, I would have preferred the citations and references as endnotes with cross-references in the main text. But perhaps because of her long experience as a journalist, the author did not want to ‘clutter’ the narrative with reference numbers. I also missed an index. Since I have reviewed the book for Moneylife, I will not go into the subject matter of the book. Here, I will share some of my views as a social historian and biographer on the use of archived letters. With such a treasure trove of resources, I wonder why the author/publisher did not use the letters as images. These would have not only added to the design dimension of the book but perhaps brought the characters to life more effectively. 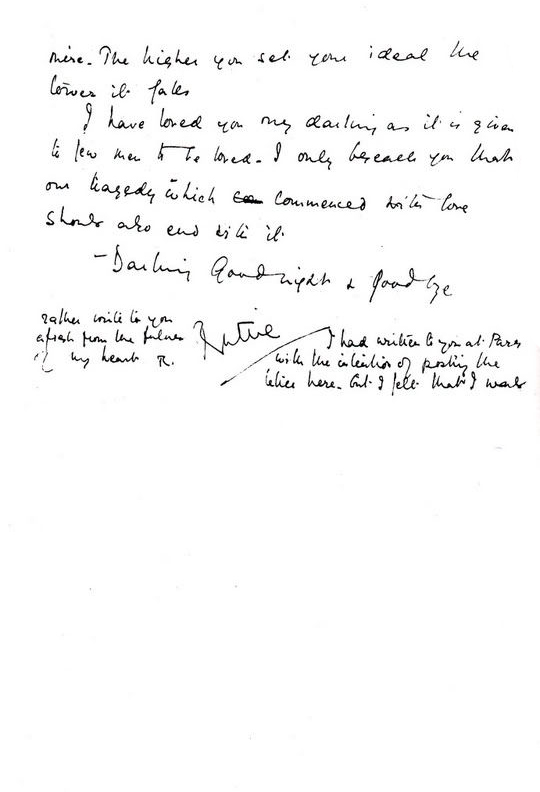 As an example, reproduced below is the last letter that Ruttie wrote to Jinnah. It is as poignant a missive as a heartbroken 28-year-old could have written in the second decade of the past century. She wrote it on 5 October 1928, on board SS Rajputana on which she travelled to India after she had been nursed back to life in Paris by Jinnah. Yet, they decided that they would go their separate ways. She writes, “When one has been as near to reality – (which after all is death) as I have been dearest, one only remembers the beautiful and tender moments and all the rest becomes a half veiled mist of unrealities. Try and remember me beloved as the flower you picked and not the flower you tread (sic) upon. I have suffered much because I have loved much. The measure of my agony has been in accord to (sic) the measure of my love... had I loved you a little less, I might have remained with you. Only after one has created a very beautiful blossom, one does not drag it through the mire. The higher you set your ideal, the lower it falls... I have loved you my darling as it is given to few men to be loved. I only beseech you that our tragedy which began with love should also end with it. Darling, good night and goodbye. Sheela has quoted the letter as text. 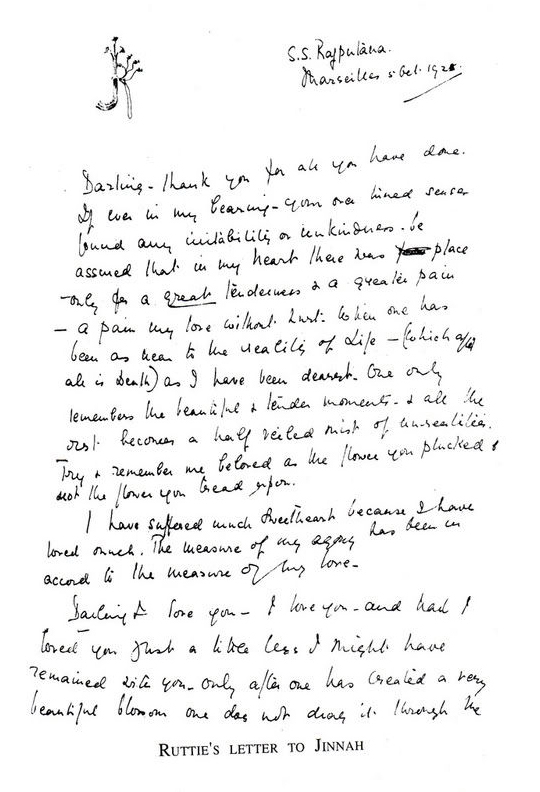 Notice the difference when you see it as an image in her handwriting – the tenderness that it oozes. There is no shortage of drama to the story of this May & December marriage, especially when the protagonists are MA Jinnah and Ruttie Petit. Twenty-four years older to her and a friend of her father, Jinnah was a leading Muslim barrister in Bombay and, by then, already a powerful politician. The only daughter of Sir Petit, Ruttie was a girl of 16 when they fell in love, so pretty, vivacious and fashionable that she was known as the ‘flower of Bombay’. Sheela gives a glimpse of how the politics of the times as well as his personal life gradually transformed Jinnah from being a liberal Muslim (and a ham-eating, cigar smoking, alcohol-drinking to boot, one who sent his sister to a missionary school, where she was the first Muslim girl to be admitted), to a more staunch and conservative one. Perhaps the romance, and the marriage, was doomed because of the huge age difference between them. She was so vivacious, full of energy to explore and live life to the fullest and he was so seriously involved in the politics of the times. She truly wanted to be by his side and participate to the fullest in his political journey– something that was not viewed kindly by the Muslim community that gradually became Jinnah’s main constituency as the Home Rule Movement and then the Indian National Congress changed gears after Gandhi’s emergence on the Indian political scene. Unused to playing second fiddle, Jinnah became more and more involved in strategising with the Muslims, to the exclusion of Ruttie. So in this triangular love story, she lost out to her competitor – politics and Jinnah’s overarching ambition. 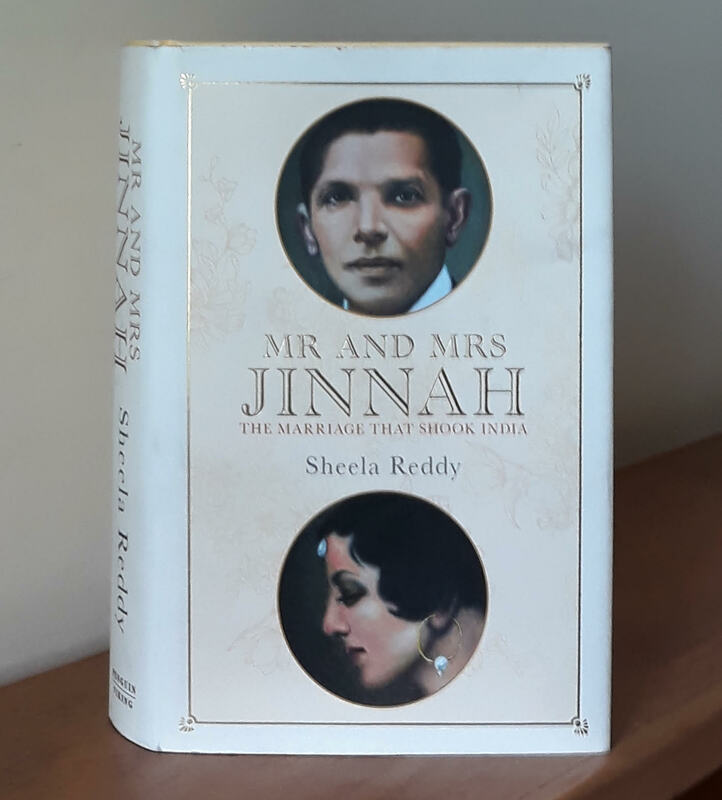 Sheela says that Jinnah “drove her mad with his inhuman lack of all emotion, or so it seemed, and his punctilious sense of duty, as if she was no more to him than a duty he must discharge... (she got) the sinking feeling that she was being erased as an individual” (p282). Within a few years, their meteor of love had extinguished itself. Ruttie died on 20 February 1929, her 29th birthday, alone in a house where she stayed after moving out from the Jinnah residence, consuming an overdose of sleeping pills, leaving her daughter, Dina, and her inconsolable husband, who never married again. As a student of social history, I have for long been advocating the need for documentation and archiving, especially in the context of Indian businesses which have witnessed a complete transformation in their environment. With nearly half a century of research experience, I am acutely aware of the paucity of archival materials that can be used as evidence for writing biographies and corporate histories. Hence, I take every opportunity to persuade business organisations, as well as NGOs, to preserve documents that would authenticate future historical writing. Often, organisations and people unthinkingly discard correspondence, files and even photographs. This has become more rampant now as physical space (real estate) has become more expensive or because no one has the time to sift through and organise old stuff. History is not a priority; future planning is. Also, with changes in technology for communications having undergone a metamorphosis, much of the exchange of information and views is no longer by way of letters; it is being done on the telephone or on emails – media that can be easily obliterated. This aspect of technology had affected ‘collective memory’ negatively. And people have, so far, not started using digital technology as extensively as they should (or could), to preserve the past. Hence, when I got an opportunity, in 2007, to initiate the process of creating oral history records for a family business, I took up the project eagerly – as much out of my belief in the need for building up such resources as for the demonstrative effect it might have on other corporates. Forbes Marshall was a 61-year-old business, in 2007, and offered ‘ideal material’ for creation of oral history records (OHRs). The company began with trading, ventured into import-substitution manufacturing and now operates at the frontiers of technology. Fortunately, the promoters as well as many members of the old team were still available for being interviewed and their memories were not covered by the mists of time. For those who may not be familiar, oral history collects memories and personal commentaries of historical significance through recorded interviews. An oral history interview generally comprises a well-prepared interviewer questioning the selected person and recording the exchange in audio or video format. Recordings of the interview are transcribed, summarised, or indexed and then placed in a library or archives. These interviews may be used for research or excerpted in a publication, radio or video documentary, museum exhibition, dramatisation or other form of public presentation. An OHR does not include random taping, nor does it refer to recorded speeches, personal diaries on tape, or other sound recordings that lack the dialogue between interviewer and interviewee. The project commenced in October 2008. Over the next two years, I did 53 interviews; running into 2,687 minutes (nearly 45 hours) of audio recordings, that take up some 1,241MB of digital storage space. These were submitted on seven CDROMs along with printed copies of the transcripts as well as the soft copies (as Word files which were converted into pdf documents) for ease of access. These run into nearly 700 pages; organised chronologically by the date of the interview. At the stage that I undertook this project, the technology for recording, transcribing, and even organising the ‘data’ with keywords and indexing it into searchable databases, was not what it is today. So the transcriptions were done manually! Today, software is available to do it all. Anticipating the difficulty that future users might face in going through such voluminous data, at the beginning of each transcript, I provided keywords and concepts that could be searched on the Word/pdf files. I also gave the cross-reference details of the duration of audio recording and the transcript on each page of the printed document. This was to facilitate the user to go to the exact minute, or second, of the recorded interview for, say, an audio clip for a voice-over in a film, rather than having to listen to the entire recording. Users working towards creating publishable documents and wanting to pick up an entire quote from the ORH would not need to word-process from the recording; these could be just copy-pasted. Identifying the persons to be interviewed and preparing their bio-sketch from HR records; this enabled me to contextualise the OHR and obtain focused information. Doing the audio-recorded interviews – sometimes multiple -- depending on the time available from the person and the ‘information-richness’ of the interviewee. Transcribing the recordings, extracting the knowledge content of the interview, and preparing a detailed index for each interview. Creating a separate database /catalogue of these tapes/CDs with detailed content index – which could be managed by the company’s library. My responsibility ended with the penultimate point above. Since then, FM has created another series of OHRs which have also been used for writing the history of the company. The history has now been published as a book titled: A Different Business: The Forbes Marshall Story. That the project achieved its objective – of “result(ing) in stories, anecdotes, case-studies and other kinds of documentation that can be then shared within the organisation as well as with the outside audiences” – is amply visible in the many, many quotes from the OHRs in the book.